This window is for adding a new IP Filter. 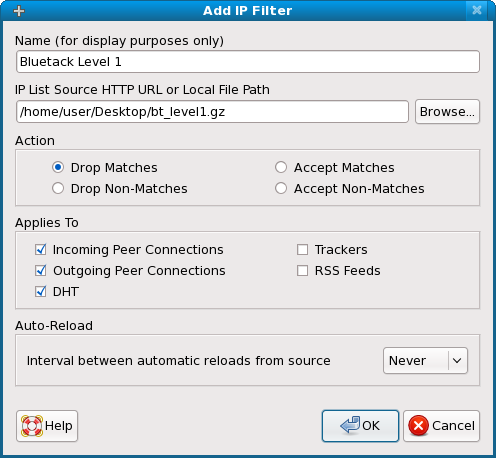 It is presented when the user presses the 'Add' button in the IP Filter View. Enter a descriptive name for this list. The name is purely for display purposes within the IP Filter View, and does not affect the operation of the list. This must be either a path to a blocklist file on your local machine or an HTTP URL to a blocklist on the web. The advantage of using a URL is that you can automatically or manually update the list from the web to keep up with changes. Tixati accepts lists in the "Description:ip-range" (Bluetack/PG) format, and the "ip-range,#,description" (eMule) format. Lists that are gzip compressed (filename.gz) will be automatically uncompressed as they are read. As of version 1.85, you may also enter @ followed by one or more country codes, separated by spaces. If an IP is found in the list, it will be blocked. IPs not found in the list will continue to the next list or not be blocked if there are no more lists. If an IP is NOT found in the list, it will be blocked. IPs found in the list will continue to the next list or not be blocked if there are no more lists. If an IP is found in the list, it will not be blocked. IPs not found in the list will continue to the next list or not be blocked if there are no more lists. If an IP is NOT found in the list, it will not be blocked. IPs found in the list will continue to the next list or not be blocked if there are no more lists. The scope of the block list can be adjusted with these checkboxes. IPs from sources not selected here will continue to the next list in the IP Filter View or will not be blocked if there are no more lists. Using this feature will cause Tixati to automatically update the list from the HTTP URL or file path entered as the list source. You can also manually update any list in the IP Filter View by simply selecting it and clicking the 'Refresh' button.